It’s the simplicity of it all that needs to be kept in mind. And somehow I was able to maintain that level of understanding when I was washed out of my raft by a wave the size of a semi-truck. Everything was perfectly aligned. 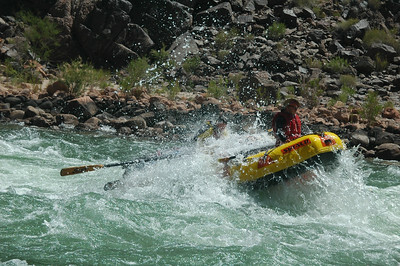 I had just crested the first two big waves of Serpentine Rapid, 106 miles into our rafting trip down the Colorado River. But it was that third wave that had it out for me. The first two were big, as in swallow-your-car big. The third was bigger. Crashing through the foaming water churning at the crest of each wave, the water came washing over the top of my boat. Once my eyes cleared from the deluge, I found myself peering 10 to 20 feet below into a trough of swirling white water, and the roller coaster ride would repeat. Down into the depths, and up the wall of water on the other side. As long as I kept my bow square to the crest of the wave, I could keep physics on my side, making it as difficult as possible for the phenomenal hydraulics at work from flipping my raft. My little raft. 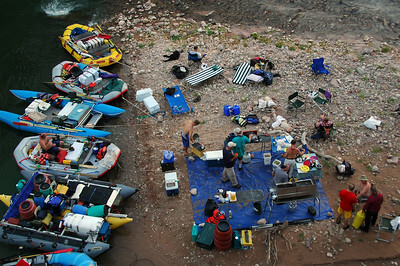 Most rafts on the Colorado are 16 or 18 feet long, with proportional widths and tube diameters. The size gives them greater buoyancy and better leverage for fighting the “flip factor.” My boat was a 13.5 foot self-bailing Miwok model, with an inflated floor and holes around the edge to let water in the raft flow back out. This design does compromise speed and agility compared to a flat bottom boat. But since I was the only raft in our group with one person in it, I did not have time to be rowing and bailing water with a bucket as literally hundreds, if not thousands, of gallons kept pouring into my boat from the towering waves I was charging. Rapids are dynamic. Factors of all sorts – the size of rocks under the water, the speed and volume of water, the width and depth of the channel, if the rapid is on a bend in the river or on a straightway – come into account to form these and there are many influences which make them dance the way they do. Back in the dance of Serpentine Rapid, cresting the second wave, I gasped when I got my first view of the trough in front of me. I dipped my oar in and pushed, dropped the other in and pulled, to keep my bow pointed straight down the trough so as to ride squarely to the top of the wave. It looked good. Better yet, it felt good. As I scooped through the bottom of the trough and started to climb it, a peripheral wave collapsed and sent a rush of water hurling towards me. Suddenly, I wasn’t aligned to charge the wave as I should have. This onslaught of water come over the top of my boat, I gripped my oars as hard as I could, and pushed my body into the flanking charge of water to resist it. What happened next was as if somebody had taken the roll of film that is my memory, snipped a few frames out, and spliced it back together. After my attempt to brace myself against the surprise attack of water, I had no recollection of being washed out of my boat. I didn’t recall being lifted off my seat, my hands being pried from my oar handles, the pressure of the water against my body, nothing. Next I knew, I was floating in the river and my boat was 15 feet down river. I admit my first thought was not the Zen-like “We’re just rafters.” Though, I simply questioned: “What is my boat doing over there?” Without waiting for an answer, I realized I had to get back in my boat. I started swimming. The raft was now going through the rapids sideways, and I managed to reach it climb back in. Pulling myself out of the water and back into the raft, I encountered more resistance than expected. 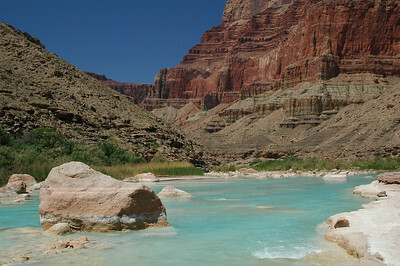 This rapid, Serpentine Rapid, is a level 7 rapid, as described by the Grand Canyon’s 10-level rating system. We had been through level 7 rapids before on this trip, even a few level 8’s the day before. And this morning, we had tackled our first level 9 rapid, Crystal Rapid, at Mile 98. In preparation for that rapid, many of us donned our whitewater armor: wetsuits, gloves, and helmets for some. Extra care was taken to ensure everything on the boat was firmly and securely strapped down, and as watertight as possible in the event a boat flipped. We didn’t want our fresh salmon filets, or a bag of potatoes to get away and ruin our dinner that night. Crystal Rapid was big. Way bigger than Serpentine Rapid, easily two levels bigger on what felt like an exponentially increasing order of magnitude. We all got wet. We all had water crashing over top of us. Even the big boats would at times be totally submerged, only the heads of the rafters poking out of the whitewater foam, with maybe an oar or two flapping like the skinny pathetic wings of a scruffy bird trying to gain purchase in the air. But, we cleared Crystal and nobody flipped their raft. People lowered their guard as we continued through the level 6 Tuna Creek Rapid, the level 4 Willies Necktie Rapid and others leading up to Serpentine. The 100°F+ temperature quickly dried out my wetsuit and, like others, I unzipped and peeled the upper portion of the Farmer John style bib down to my waist. This is why I had trouble getting back into my boat at Serpentine Rapid. Between the rapid, the swim, and hoisting myself out of the river, my wet suit was no longer covering my legs. It had been peeled down to my ankles, and was now filled with water, acting as a sea anchor. Luckily, I had enough adrenalin coursing through my system that it did not keep me from getting back into my boat on the first try. I learned the hard way that unzipping my wetsuit was way more dangerous than not wearing it at all. Once back in my boat, I fished my oars out of the water -they were retained by a little piece of parachute chord tying them to the boat frame. With my oars back in place, I regained control of the boat and enjoyed the rest of the ride through Serpentine Rapid. I have logged many river miles. Either as a member of the paddle boat crew on day trips with my scout troop, on overnight trips on the Kali Gandaki River in Nepal, and even guiding paddleboat trips on the Deschutes River in Oregon. But before this river trip I had only had one day of practice in my own oar boat. 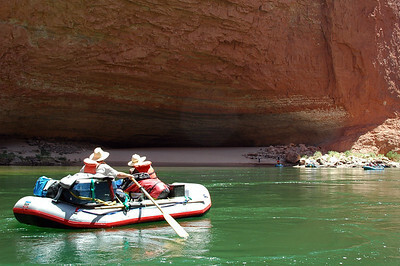 Each day on the Colorado River, new lessons were learned and applied. Being washed out of my boat was a big lesson. We went through Crystal and Serpentine rapids on our ninth day on the trip. Three days, 50 miles and almost two dozen rapids later, I got washed out again. 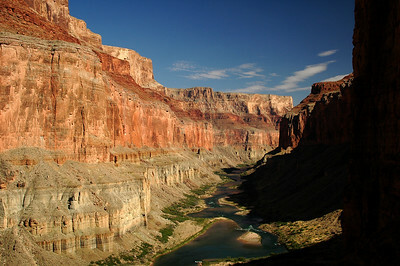 But the Colorado River streaming through the Grand Canyon has more to offer than just turbulent rapids. Most of the river is calm. The rapids are compressed into 10 percent of the winding river that would take us 225 miles across the map. The remaining ninety percent would be clear smooth water with hardly a ripple. When there was no wind, we could just drift along and let the scenery float by. Conversations of all sorts would get going, and voices would carry across the stillness, making it easy to eavesdrop or participate in any conversation. I would often just sit back and watch the layers of rock above. I would try to quiz myself on naming the various layers of rock and dream of the time, some two billion years ago, when these sediments settled on the floor of an ancient sea, before being compressed into the rock that now hovers above the river. Other times, I would put my nose in a book and look up only to realize I had been caught by a subtle eddy. Slightly perturbed, I would have to put my book down and row myself back into the middle of the river, where the current allowed me to pick my book back up. Soon, I would hear the sounds of an approaching rapid. Books, cameras and other things I wanted to keep dry would go back into their protective pouches, bags or boxes. I would then either run the rapid or, if it was a large rapid, pull over to scout it. This time, I felt myself go. I felt the surge of water grab me and tear my grip from my oars and throw me into the violent turbine-like churn of Upset Rapid. Like many rapids level 6 and above, we stopped above this one to scout. There were two options to get through this rapid. 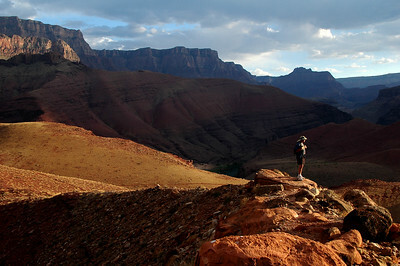 A debris fan of fallen rock from a side canyon sprawled into the river from the right, forming a shallow obstacle course. On the left side, a solid vertical wall of stone contained the biggest waves of the rapid. The waves formed a massive rollercoaster. Down the center looked safer, like it would be a good fun ride, and that is what most of us opted for, except Larry. Larry, who works as a river guide in Oregon and had been down the Colorado before, went first. In his big boat he plowed through the big powerful waves of river left. His boat would crest then disappear from our view behind the waves for a few moments, then come rocketing back up the next wave and disappear again. It looked like a good ride, but when I watched Eddie take the middle road in the same size boat as mine and get tossed around a bit, I figured that would be the best route for me, too. I entered center and was feeling really good about my ride through Upset Rapid. Larry, now out of his boat and on the shore downstream of the rapid, was climbing his way up the right shore and gesturing me towards river left. Then a big thumbs up. It must not be as big as it looks, and always looking for a challenge, I pointed my boat towards the big stuff and started to move left. Max told me he was watching from the scouting point above the rapid wondering what I was doing. Earlier on the river, Lynn, our oldest member on the trip, an experienced river runner and on his fourth trip down the Grand Canyon, pointed out, “the entry into a rapid is the most crucial moment.” My entry was good for running the middle of the rapid, not so good for getting over to the big water of river left. My boat slipped in from the side of a trough between the big standing waves and I pulled back on my starboard oar to align myself to ride up the big wave. Crashing through the crest of that, I still had some residual momentum moving me left towards the massive stone wall. I didn’t even have time to think about what sort of evasive maneuvers I was going to employ, because just then a big wave came bouncing off of the wall and pummeled itself into the side of my raft. Undaunted, the flow of water rushed over the top of my boat and hurled me from my cockpit. I felt my arms flailing around looking for anything to grab. This feeling was confirmed by Dan who watched it all happen from shore, it was like I had eight arms all reaching in different directions at the same time. And then I was in the water. I was under the water. I was getting mauled by the violent currents hidden beneath the ruckus show of waves and turmoil on the surface. The cliché would be to say I was so twisted and turned around didn’t know which way was up; but I knew. I could feel myself upside down, realizing I wasn’t wearing a helmet and praying this rapid was nice and deep. I could envision my head smacking into some sub-marine rock and cracking my skull. There was nothing I could do about it except wait for the buoyant properties of my life jacket to kick in and bob me to the surface. Life jackets are designed to float in water, not air. While this seems so very obvious, the hidden message here is that the water I was in was half air. That’s why it’s called whitewater: it’s mixed with air. There was so much air in the water from the churning and stirring caused by the rapids I could feel the air bubbles all around me. I could feel them rolling around on my skin, it almost tickled, like I was swimming in a glass of soda water. Surrounded by this effervescence the life jacket was not as buoyant as it would have been in a dead calm lake or the gentler and slower flowing parts of the Colorado River. Too thick to breathe, to sparse to swim. Finally, I felt like I was right side up again, skull still in tact and I took in a deep breath when my head popped out of the water. This time my boat was up river from me and I had to swim against the current to get back to it and hoist myself in again. Since I went out of the back of the boat again, I can only guess I ended up down river from it because I moved faster in the underwater current and went right under my boat stalled on the surface. I was told later that my boat was at the teetering point of flipping all the way over. It was standing up on its long end, perfectly vertical out of the water at the top of the wave. A single droplet of water may have influenced the balance to keep it from dumping. This rodeo style of river rafting, being bucked out of my boat and pulling myself back in, was my exclusive little trick on this run down the Colorado. Others were not as fortunate. In the course of the whole trip we had five flips and fifteen ‘involuntary’ swimmers amongst our crew. I only witnessed the flip in Basalt Rapid, which is not rated, but has one particular spot where some very strong hydraulics took a 16-foot boat right over sideways. The oarsman was very new and got sucked in and flipped over leaving him with a huge bruise on his inner thigh where the water took control of his oar and clobbered him with it. 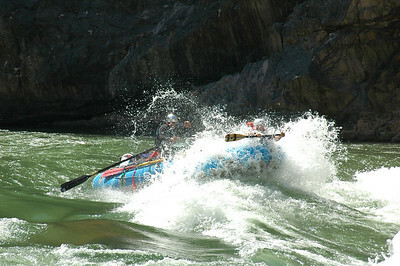 Three other flips caused various head injuries in major rapids as the resurfacing survivors bumped their heads against the frame or oars or some other hard part of the gear on the raft. One head laceration was tucked under the wet rafters hair, which had to be shaved away to properly clean the cut. The most notorious rapid of the river, Lava Falls Rapid, rates a level 9. Like Serpentine there was a big-water side, this time on the right, and a technical obstacle course of boulder dodging on river left. Larry took the first run, river right, and had a great run. His big boat was pushed and shoved by the mad waters and he kept clear of a long run of rock on the right known as the Cheese Grater – a swath of rapidly cooled lava and therefore sharp and rough textured rock that would shred a raft, its occupants and all the gear it was carrying to ribbons in seconds as the force of the water grinds against it. Again, we were all ready for the worst. Wet suits on and zipped all the way up, gear strapped down and the somber silence of humility hushed over the group. The river well above Lava Falls obliged to our humble tone and the morning waters were calm, smooth and peaceful. It started to get a little eerie when we started passing huge chunks of solidified lava along the shore. Vulcan’s Anvil, a massive piece of barren volcanic rock the size and shape of a medieval guard tower sits in the middle forming its own island. It sits in quiet tranquility, just before we can start to hear the roar of Lava Falls down river – like the faint deep snoring of a distant giant we would have to confront. Slowly the roar grew louder but the water remained calm. It was an odd juxtaposition of our senses – what we saw not matching what we heard. We parked out boats and climbed a small hill to peek down upon our next challenge and suddenly the sound of the rapids was deafening in our ears. Lava Falls was impossible to miss. 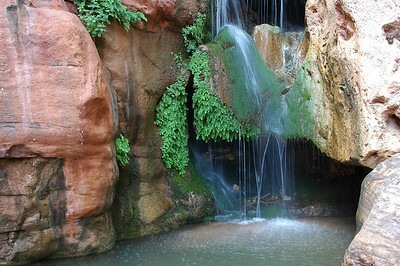 It’s where the river turns from green to white and stays that way for a half mile as is blends into Lower Lava Rapid. It was littered with huge holes in the water surrounded by massive standing waves that would grow and spit water up into the air, then collapse onto themselves and repeat. After watching Larry run the right side of Lava, most of us turned to head back down the hill, anxious and giddy to have our own run. A few boats, including Eddie, pulled out ahead of me and we gave them plenty of room to run the rapid on their own without having a bunch of us stacked on top of each other. I rowed myself out into the smooth calm waters above Lava Falls Rapid. Looking down river, I couldn’t even see the rapids ahead of me. The water just ended. A smooth horizon was all I could see where the river bowed downwards and made that amazing transition from smooth glassy green to the violent mayhem of foamy churning white. Standing in my raft, I am slowly able to spy over the crest and see the monster hiding behind the horizon and I spot my point of entry and head for it. In twenty seconds it was all over. The rollercoaster ride took me to great heights and I plummeted down in to the gaping troughs between the spikes of water lashing up to the sky. The river sped up to 10 mph whizzing the Cheese Grater past my right side like a wall studded with outward pointing daggers trying to slash at me. I pivoted the bow of my boat to point slightly to the right and started rowing backwards to pull my self away from the wall. Another drop from crest to trough would leave my stomach in my throat and I would gasp at how helpless and truly fragile I was deep in the clutches of the power of nature. And then, I was riding out the remnant trailing waves as the water regained its calm after such an impressive display of loosing its temper. Excitement started to well up in my hart as it was starting to look like I would clear the right side of Lava Falls unscathed. I pulled my raft over and jumped out to get some photos of those to follow me. Each raft had a great ride. All but one went right. Max and Rich, maybe a little gun shy, and rightfully so after having been flipped already, put on an impressive show working their way through the boulders on river left, like a precise choreography dancing down the river complete with lifts and pirouettes. Further down the river, I met up with the rest of our crew to find them flipping Eddie’s raft back over. I hadn’t realized it while I was going through Lava that Eddie, in the same size boat as mine, got thrashed by the river. Eddie, who has more time and experience running rivers and rapids than most of us on the trip combined, took the exact same route as the rest of us did, according to Rene who watched it all play out from the scouting point above. The difference was the timing. Eddie and his passenger John got caught between the waves as the waves stacked themselves up to their maximum height and then collapsed. Like water droplets slowly dripping onto a leaf and accumulating before the leaf succumbs to the increasing weight and bends to let the gathered droplets flow on, so too, does a wave in a rapid build and fill to a point when the mass of water becomes too great to sustain its own size and it collapses like the breaking of a dam. The top of the wave starts to curl back onto itself and a tumbling waterfall rolls back – upriver – making a formidable surging wall of water. It was at this moment, in the reverse flow, at the foot of this wall, that Eddie and John found themselves. Standing on the front of the thwarts, leaning into the momentum of the speed of the boat as it charged this wall of water, they were bracing themselves for the impact. Eddie had his weight on the oars, pushing the raft forward hoping a little speed will pop them right over the foe before them. When they hit, it stopped them dead in their tracks. Eddie’s weight on the oars was multiplied and the port side 30 year old Smoker’s ash oar cracked in half and their raft crumpled into the wave like a crash test vehicle into a brick wall. The wave overcame them and the details on how the raft got flipped have washed away with the water that caused it. It may have been that because an oar broke, the other oar, still pushing, pushed them sideways. Or, simply, the water just had it’s way with the boat and sent Eddie and John into the drink. Eddie recalls his own tumbling dance underwater and coming up under the raft knocking his head on an oar or something hard leaving a good gash on his forehead. He last saw John leaning forward, leading the charge into the wave that upset them. When John resurfaced near by, they both grabbed hold of the raft from the up-river side and rode the rest of the rapid out. Weather or not they narrowly escaped being ground to fish food along the Cheese Grater, we know not. But we do know they made it out in one piece and when we flipped the raft back over, Eddie’s extensive strapping job had held together and although the entire boat had to be repacked, everything was accounted for. That afternoon, after we landed at camp, Eddie and John, like the others who flipped before them, pulled everything out of their raft and strung it all out to dry. Tents, sleeping bags, clothes and more were exposed to the sun and the light wind that blew threw camp to become useable again. Then, sitting around with the comfort of food in our bellies, the stories and tales of living through such an experience entertained the group. We had been warned prior to our trip that May was a windy month for the Grand Canyon as a broad temperature difference between the upper and lower canyon causes a need to equalize the atmospheric pressure. We had a day or two here and there where we had to fight the wind to get down river, but the winds didn’t really kick in until the last few days of the trip. As we strained to row down river against the up-canyon winds, at times realizing that despite our efforts we weren’t making any headway at all, a recognizable rock on the shore would mock us by just sitting there. Once we got to camp, the wind would pick up in gusts and send the fine grains of sand into our eyes, food, sleeping bags – everywhere. Oddly, this made us grateful. Grateful that we didn’t have to deal with this the whole trip. The next morning, our last day, we broke camp and fought against the wind to polish off the last five miles of river to the Diamond Creek Take-Out. This entry is filed under: North America, Raft, Story, Water. Looks good. Thanks for letting me know. Glad you enjoyed the story & photos!